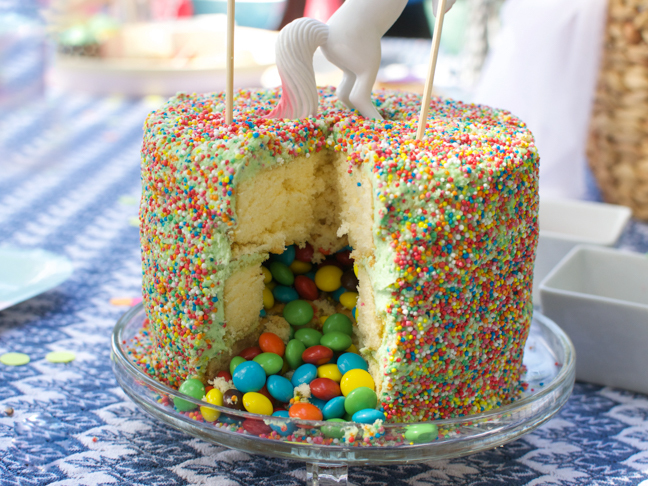 Have you noticed the lack of actual cake eating that happens at children’s parties? Sure there’s a lot of hype, some enthusiastic candle-blowing, decoration-snatching and icing-licking, but the cake itself? Yeah, not so much. A few years ago I declared parties a packet mix zone, because the kids didn’t care about my Dutch cocoa mud cake, with the fancy type of vanilla extract. 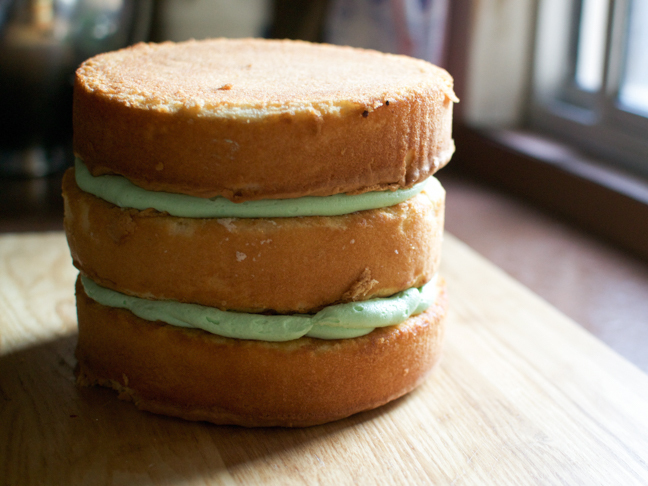 But for this cake I took it one step further and just bought the sponge. But wait, I’m getting ahead of myself. So, I was thinking about what cake to make for my little lady’s fifth birthday so first I asked the question; what do kids like? Ummm, the decorative lollies, the icing, the candle, the singing and the cutting. So I made a pinata cake that was all about the fanfare and not the actual cake it’s self. Although ‘made’ could possibly the wrong word. Maybe ‘assembled’ is more accurate. 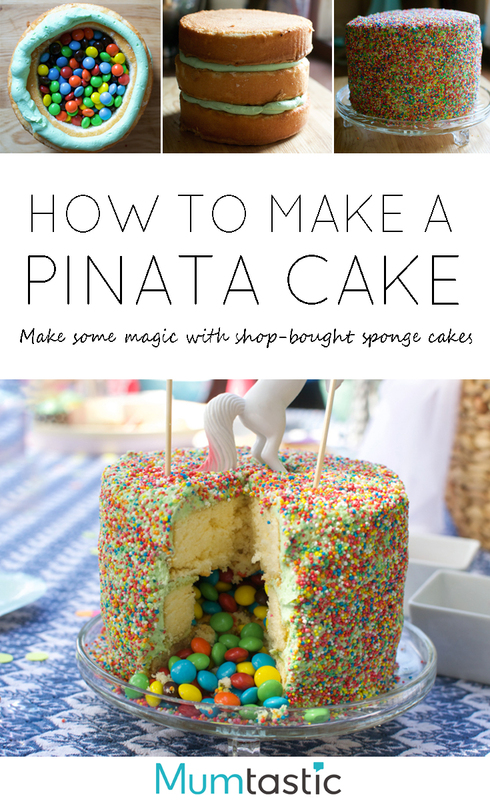 Anyway, I hope you enjoy the piñata cake, the kids sure did, well… they enjoyed everything except the actual sponge, the chickens ate that. Step 1: Using a whisk attachment, soften the butter in a stand mixer until it is smooth. Add the icing sugar one tablespoon at a time, it takes a while but makes a huge difference in texture. Add the gel colour, milk and the vanilla extract and whip it until it looks smooth and even. Now pop it in a piping bag or a sandwich bag with the corner cut out of it. 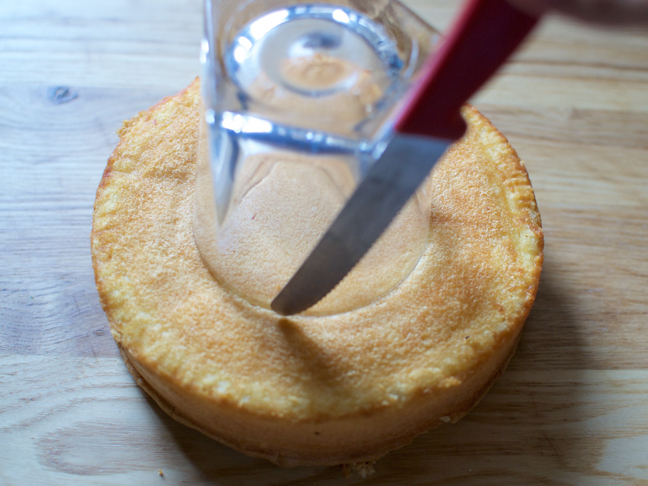 Step 2: Use a knife to cut a circle out of one of your sponges. I used a glass as a guide. Now you should have two whole sponges and one that looks like a donut. I froze the cut out bit and we decorated it as a mini cake for her actual birthday, it was the perfect size for our little family. 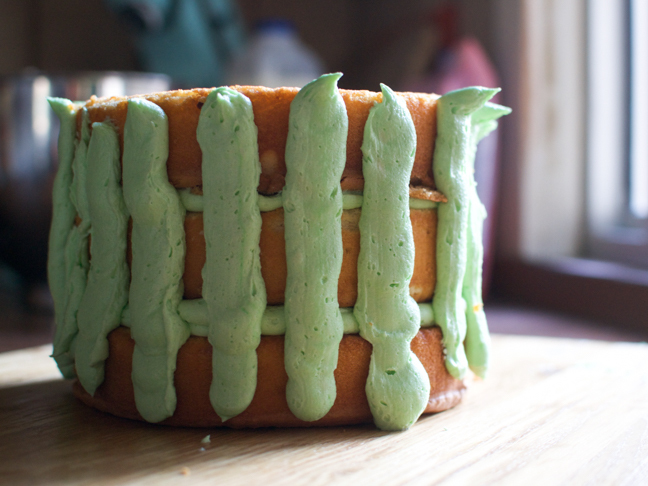 Step 3: Put one sponge on your serving plate, pipe on a generous circle of icing around the boarder. 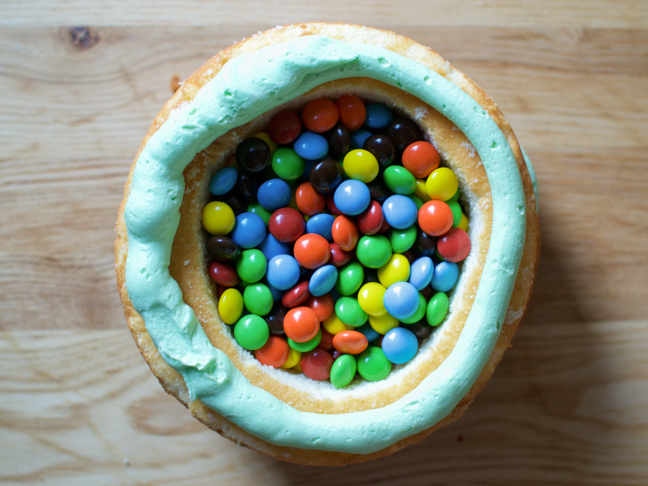 Now pop your donut sponge on and fill the well with the lollies. Pipe another icing ring around the donut layer and put the third sponge on top. Step 4: Straighten out the layer at this point, brush any loose crumbs off the outside of the cake. Try to look at it from all angles to see if anything needs to be flattened or straightened. I failed this stage as you can see. Step 5: Pipe the icing onto the cake just to get it evenly applied then use something flat to smooth it all out. If it is feeling a bit sticky, just put it in the fridge for a minute and it should harden up a bit. Step 6: Now for the messy part, cover it in the sprinkles, I haven’t discovered an easy way to do this. 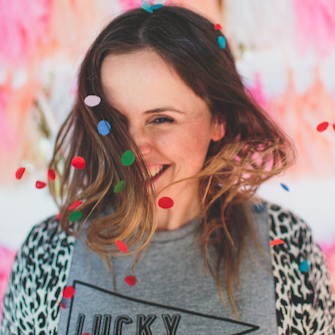 I ended up just kind of repeatedly high-fiving the cake (gently) with a hand full of sprinkles. Please let me know if you have a better technique. 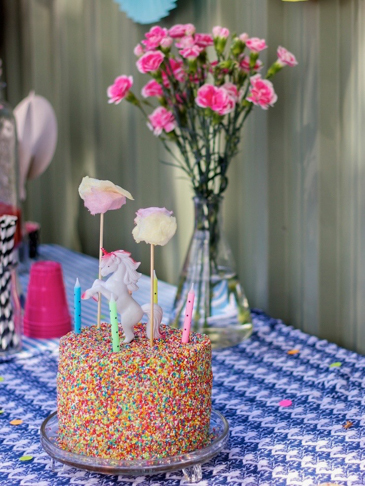 I also added a unicorn figurine and some fairy floss on wooden skewers for clouds. If you do this, make sure to have some spare in a sealed bag because it melts, dramatically, in slow motion and you have to replace it every hour or so. 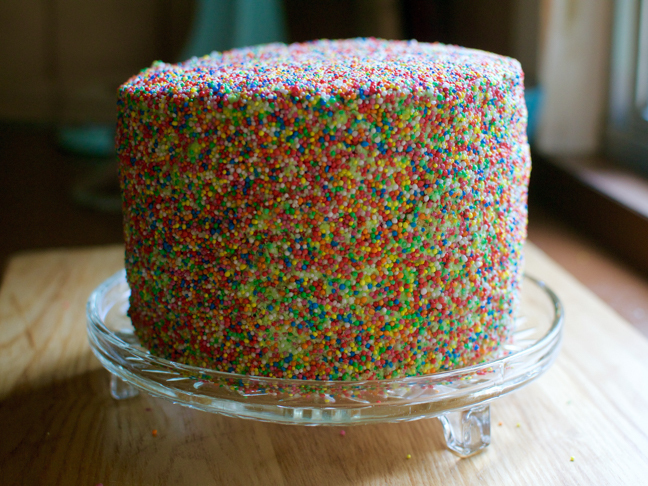 Fun fact, the layer of sprinkles was so think that when a child knocked this cake off the table just before we did the candles, it survived the fall.